This is the third time I've reviewed an App.net client for iOS. Instead of rehashing everything there is to know about App.net and its existing clients, I will cover several reasons why I believe an App.net user should consider getting this new client named Felix. Before I dive into those reasons, I would like to briefly mention that Felix has all of the expected features from an App.net client, such as push notifications; saving drafts; username and hashtag completion; image uploading via Droplr and Cloudapp; integration with Instapaper, Pocket and Readability; the ability to mute specific users and hashtag search. In fact, I think Felix has very good implementation for most of these features. In Felix, you can access your list of drafts easily from within the compose window. I really like the way Felix supports drafts. First, it uses the close button on the top left corner of your compose window to trigger the validation of whether there's anything worth saving or not. Then, it cleverly detects for empty posts and unmodified repost attempts before prompting to save the post as a draft. This helps prevent the users from getting annoyed by pop ups each time they want to cancel their posts. I believe subtle design decisions like this contributes to the overall experience of using the app. Once you have at least one saved draft, you will see a folder icon shown on the top bar of your compose window. Tapping on the icon will show you a list of all currently saved drafts in reversed chronological order. You can tap any one of them to edit and post, or tap the close button on selected draft to delete it. Felix has an exclusive feature that's not available even in the App.net API, i.e. starred conversations. One of the early features that were missing from App.net was the ability to mark a post as favorite. However, since two weeks ago, App.net API has added the "Stars" feature and I believe Felix is the first iOS client to have implemented it. Felix has even added a way to star an entire conversation, not just a particular post. I believe this is currently a feature exclusive to Felix, and not an official App.net API feature. Instead of using Storify integration, this is a much easier (and hopefully reliable) process. You can find your starred conversations, alongside your starred posts and other settings in the Dashboard tab. Felix supports two types of repost, i.e. native repost and repost with comment. In the early days of App.net, there were two conventions proposed by the community to write reposts, i.e. >> and RP. With an official update two weeks ago, App.net has added support for native repost. Similar to native retweet on Twitter, this allows you to see the avatar of the user whose post is being reposted by another user you're following. I believe this is a crucial step forward to allow a more natural way of finding new people to follow on App.net. Again, I believe Felix is the first iOS client to implement this feature. Using a recycle icon on the bottom of each post in the timeline, you can easily submit a native repost. You can confirm this by visiting the Dashboard to see a list of your own posts. As far as my testing goes, I could not confirm my repost in my own timeline, regardless of the clients that I used, which included the Alpha web client. I hope the App.net team can fix this in the near future. 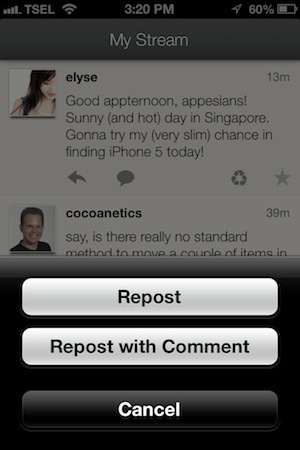 If you want to write a comment to your repost, you can tap and hold the recycle icon to trigger a popup that allows you to choose between native repost and reposting with comment. Felix can dim IFTTT cross posting that includes non-App.net mentions. Today marks the day of Twitter removing the ability for IFTTT to push/backup tweets to places like email, Dropbox and App.net. In an e-mail that IFTTT CEO Linden Tibbets sent to its users, he mentioned that all recipes using Twitter Triggers will be removed. Rest assured that there will be no more cross posting from Twitter to App.net via IFTTT. If you're looking for an App.net timeline that is clear of any IFTTT cross posts (not just the ones from Twitter), you might appreciate this innovative feature from Felix. In the Settings menu (accessible from the Dashboard tab), you can set to dim posts from IFTTT that uses irrelevant mention handles, e.g. Twitter username. I'm not sure whether Bill Kunz, the developer of Felix, would keep this feature unmodified with Twitter's announcement, but I would love to see this feature to be extended to filter other cross posting activities. Felix is the first iOS client to implement username search. Until today, App.net API has not supported full-text search yet. Fortunately, Felix offers a way to quickly search users by their usernames. I believe Felix is the first iOS client to implement this feature. You can find this in the Dashboard tab, alongside the hashtag search. To trigger the search box, you just need to tap on the rows stating "Go to Person". If your search matches exactly to an existing user account, you will be redirected to their profile view. The Dashboard tab in Felix is where all the goodies are located. Try scrolling up and down to see the magic. After using Felix for the past 24 hours, I managed to find several tips that might be useful for you. These may not be obvious for first-time users and are not documented anywhere. If you're searching for the RETURN key, it's hidden in the numeric keypad. Felix replaces the default RETURN key in the alphabet keypad with the @ and # buttons. If you're searching for a way to follow another user, tap on the big star icon on his/her profile. You can also tap it again to unfollow that user. Felix currently does not support multiple accounts, but you can switch account by logging out from your current account and logging in from another one of your accounts. You can find the Logout link on the bottom of the Dashboard tab. Tapping on the reply button would trigger a "Reply to All" post template. If you want to reply only to the sender, you can tap and hold the reply button instead. In addition to tapping the conversation icon on the bottom of conversational posts, you can also swipe to the left to view the Conversation details. You can further tweak this in the Settings menu to show the conversation in chronological or reversed chronological order. To jump to the top of your timeline, you can double tap on the Timeline bar. If you want to jump to the bottom of your loaded timeline, you can triple tap on the Timeline bar. Tapping on a link would redirect you to the in-app browser to view the webpage, but tap and hold on that link would trigger a popup prompting you to either send the URL to your read-later service, copy the URL to the clipboard, e-mail the URL or open the URL in Safari. If you have found other tips and/or gestures, please do not hesitate to contact me. I will try to update this post with proper credit so that people can benefit from the tips. You can find the Settings menu at the bottom of the Dashboard tab. I personally find Felix to be a well designed app. I like the appearance, look and feel, and design decisions Bill Kunz made. Even though I'm unable to confirm this, Felix apparently has supported the new 16:9 aspect ratio of the iPhone 5. With major improvements such as full-text search and live feed streaming are now pending to App.net API, the only thing I find missing in Felix is the support for URL shorteners. Fortunately, Bill Kunz has confirmed via e-mail that it is already on his "radar". As of today, Felix earns the spot on my home screen. It is my go-to app for App.net client. I have high hopes for the future of Felix. I highly recommend other App.net users to give Felix a try. It is indeed the best one available on the App Store.